LinkedIn has implemented a new feature called Social Advertising. Basically it means that LinkedIn can use your name and photo in advertisements on the LinkedIn network in order to make the add more relevant. The bad thing is that you – as a LinkedIn member has automatically been opt-ed in for this new feature. 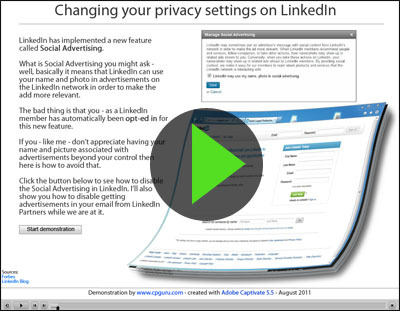 If you – like me – don’t appreciate having your name and picture associated with advertisements beyond your control then here is a short tutorial built with Adobe Captivate 5.5, that will show you how to disable Social Advertising in LinkedIn. Click the image above to start the tutorial. If you found this information useful then kindly share it with your network.